We are excited to be heading to Brazil in less than 2 weeks for a missions trip! I am planning to blog the trip here so feel free to follow along and share in what God is doing through us! 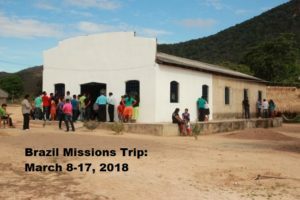 We will be, Lord willing, flying out of Montreal on March 8 to join veteran Missionaries Terry and Jane Carruthers in the Amazon region of Brazil.